I managed to finish two ornaments this month. One was a UFO from three years ago and the other was a new ornie from a three year old magazine. I needed a break from the red and green ornies of the past four months. I'm trying to stitch them in groups of four. 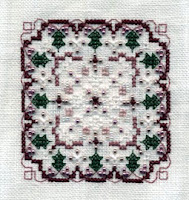 This weekend, I stitched this lovely Norwegian Ornament by Scandinavian Stitches from the 2004 JCS Ornament issue. I resumed cross stitching when my DD was two and this was one of my purchases then. Sad to say it, but this is the first ornie stitched although I really love several designs from this issue. I used DMC because the only flower thread in my possession is in a kit. Though it is not my usual style, I'm fond of it anyway and it was a fun stitch. I think it would be fun to do in shades of blue or maybe as a beaded ornament. I may try a blue version one day, or perhaps some other color variation. I started Snowberries by Just Nan three years ago, but put it to the side for some unknown reason. I had just a teensy bit of stitching remaining (including frogging one slightly misplaced special stitch) and all of the beading. The scan does not show the sparklies too well--the crystal beads vanish--but oh my goodness there were a lot of beads to add. I stitched this on an uneven linen so it looks more rectangular than square and I used Mill Hill beads rather than SJ beads because I had MH beads in my stash. This is my last group of ornaments from my maternity/medical leave. I haven't picked out ornaments for next month's SAL, but it may include a TW freebie UFO. Selecting an ornament, or two, for the SAL is as much fun for me as the stitching. With these two finishes, I have stitched 14 ornaments in 2007. That's wonderful considering I did not stitch a single ornie in 2006. I hope to complete 2 ornaments each month for the rest of the year. Of course, I still need to finish them into usable ornies. "Stuffed Snowman" from Better Homes and Gardens Cross Stitch Christmas 1996. He is stitched on yet another mystery fabric from my stash and odds and ends threads. His arms are supposed to be wire, but I used twigs from the yard instead.